Congress man Ron Paul summarises where the American political system has arrived to in a little over 5 minutes. The bill that Ron Paul talks about is the National Defense Authorisation Act, that needs repealing, was passed into law on New Years Eve 2011. This provides a huge raft of new powers for the American President to wage war anytime any place on anyone without justification to anyone, all on the basis that you need to give up your rights so they can protect you. In fact what they will do after you’ve given up your rights is take you to war, where you’ll then be powerless to stop it. US troops in Afghanistan have been placed on alert following the killings of 16 Afghan civilians by a US soldier. US officials warned of reprisals after the soldier went on a rampage in villages near a base in Kandahar. Nine children were among those killed. The killings come amid already high anti-US sentiment in Afghanistan following the burning of Korans at a Nato base in Kabul last month. US officials have repeatedly apologised for the incident but they failed to quell a series of protests and attacks that killed at least 30 people and six US troops. The reprisals are not motivated by our “Freedoms and Liberties”, but by justifiable indignation at having been invaded and treated like this. Osama Bin Laden is dead. He is was the ‘justification’ for the invasion. Does this sound like we are moving away from this war or that its about to escalate? Who is raising the ante? What comes next? An attack on American soil? Oh look, what was that law they’ve recently passed…wasn’t that just in time! Afghans “have run out of patience” with foreign troops, the country’s MPs have warned, after a US soldier killed 16 Afghan civilians. The strongly-worded resolution came as US officials issued an alert, fearing reprisals after the Kandahar rampage. Nine children were among those killed. Afghan President Hamid Karzai said the act was “unforgivable” and Taliban militants have vowed revenge. Listening to Ron Paul’s dialogue, the National Defense Authorisation Act specifically states The Taliban and its associated forces, not al-Qaeda. 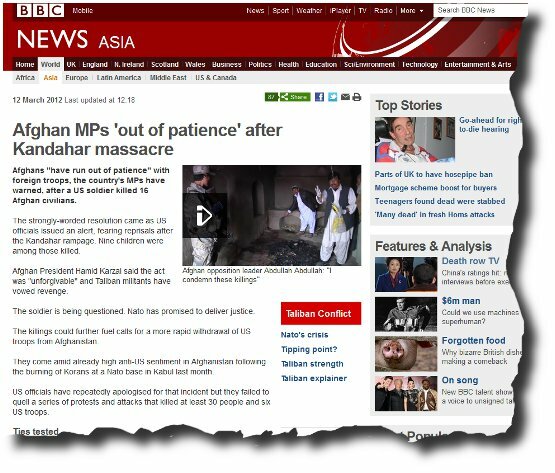 So back in June 2011 it is acknowledge the forces we’re against in Afghanistan are the Taliban, not al-Qaeda, who is the alleged crew behind the 9/11 attacks, which is why we went there. After 10 years of American troop’s deployed Afghanistan, there isn’t an incident where an American soldier has gone ‘rouge’ but within 2 months of a law being passed to tighten the security not around the troops and fighting in Afghanistan, but in the American home land, where an attack is most likely to be hardest hitting, the powers are already in place to clamp down on the local population. After all, as Ron has pointed out, all air traveler’s in the USA are already treated as potential terrorists which is why you need to have your shoes checked, potential shoe bomber, or your underwear, potential underwear bomber, culminating in a full body scan, as you might just be a plain old bomber. 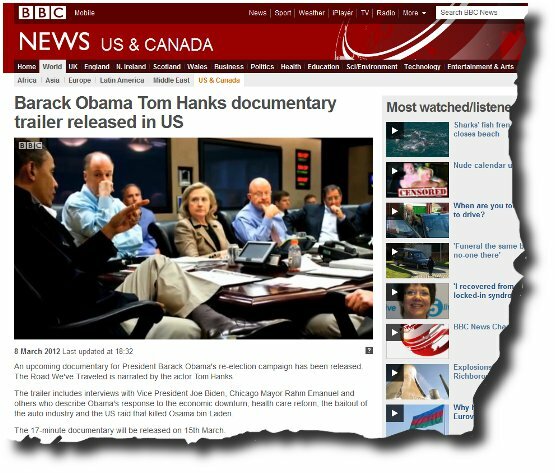 As I compiled this article I came across this promo film for Mr Obama’s re-election campaign for November 2012. That’s plenty of time for a problem to be created and for Obama to come up with an answer to save everyone.